In my occasional series of songs that could be picture books, I turn to a pretty old song. 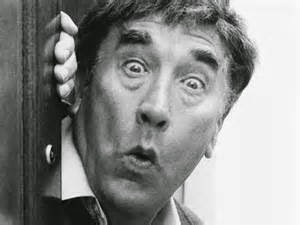 Three Little Fishes is mostly associated in the UK with the inimitable British comedian Frankie Howerd. To have the full effect of Howerd's version I would need to show all the facial expressions, sadly there appears to be no footage on YouTube. I did find this version from The Muppet Show which almost made up for it. Three Little Fishes was written in 1939 by the fabulously named Saxie Dowell, a jazz musician, singer and composer from North Carolina. It was a hit for Kay Kyser and his orchestra that year and recorded countless times. It was a mainstay of Howerd's act from the 1940s until his death in 1992, which appeared to have stopped him singing and performing. Oooh, no don't.